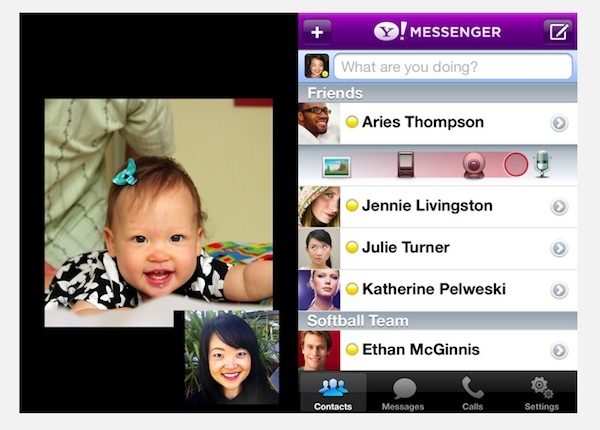 "Yahoo has updated its Messenger iPhone app to allow video calls from the iPhone to a computer, a feature that Apple has yet to release for its FaceTime standard." So now you can use Yahoo! Messenger 2.0 [link] to call not only another iPhone 4, but your home computer, be it a Mac or a PC. And you don't have to be on Wi-Fi to use it, as Yahoo! has enabled it for 3G calling as well. Obviously they recommend you use it on Wi-Fi but in a pinch, fire it up on 3G. iChat, are you next?